MMJ Electric is the right choice if you are looking for a commercial electrician in Fort Lauderdale, Boca Raton, or Boynton Beach, Florida. We have steadily grown over the years as word about the quality of our work has spread, but we have done so in a very measured fashion. Personalized attention is very important to us, so we treat every job like it is our only job, and you will definitely recognize this when you partner with our company. In addition to the cities mentioned above, if you need a commercial electrical contractor in Davie, Coral Springs, or Sunrise, we will be here for you. We prioritize emergency situations, so if a rapid response is required, we’ll be on the scene in a flash. Plus, our technicians in the field are very well equipped, so we can almost always get the job done on the first visit. Speaking of our commercial electricians, we are very discerning during the hiring process. Our company looks for people that are particularly motivated and naturally talented in this field. We also believe in ongoing training, because technology and techniques are always advancing within our industry. 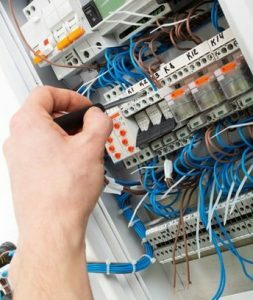 When you engage our company, you can rest assured that you will get top quality work that is completed by a team of authentically qualified commercial electricians. We offer a wide range of different electrical services to our clients within the business community. These would include panel upgrades, ceiling fan repairs and installations, smoke detector and lighting fixture installations, landscape lighting, phone and data cabling, and many others. You can rely on us to work on existing structures, but if you are building a facility, new construction work is another area of expertise for our commercial electrical contractors. Our company can rise to the occasion to handle any type of installation or repair, and we are also the go-to resource for commercial fire alarms in Broward and Miami-Dade counties. The work that we do in the field is our stock in trade, but we also place an emphasis on world class customer service from the first point of contact onward. Whenever you need a commercial electrical contractor in Fort Lauderdale, Boca Raton, Deerfield Beach, or any nearby other community, give us a call at 954-876-1536 and we will take care of the rest.